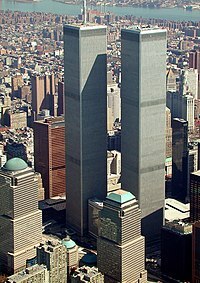 This category is mostly used for images of the World Trade Center in New York before its destruction, though some subcategories include images of 9/11 and its aftermath, "ground zero", and "the pile", as well as those related to the rebuilding process of the complex. See also the September 11 attacks category and other categories. The One Trade Center served as the corporate headquarters of Cantor Fitzgerald and the headquarters of the Port Authority of New York and New Jersey. Pages in category "World Trade Center (New York City)"
Media in category "World Trade Center (New York City)"